The Ravenna-based company Micoperi on May 7 concluded the reclamation of the seabed of the island of Giglio where the "Costa Concordia" was wrecked. The recovery of the wreck and transfer to Genoa for the dismantling were carried out by Micoperi with Titan, a consortium just on May 7, 2012. The operations of righting of the wreck were concluded on September 16, 2014. An Irishman has been jailed in Italy after stealing a backpack from the wreck of the "Costa Concordia". Sean Ruddy, 41, was convicted alongside three other salvage workers after they stole a number of ‘souvenirs’ in November 2013. 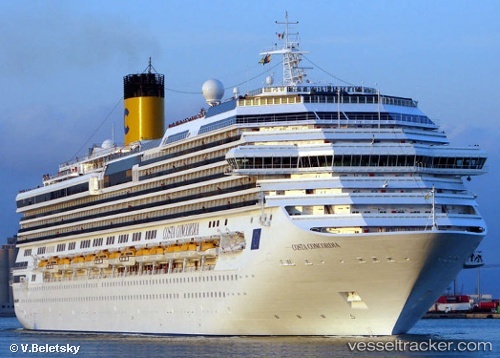 Mr Ruddy was convicted alongside British national David Freeburn, 47, for stealing a bag with the Costa Concordia logo on it. The two men were jailed for six months and handed €200 fines. South African citizens Melvin Lotter, 31, and Hendrik Johannes Venter, 33, were sentenced to four months in prison and fined €200 for violating police seals. All four men were employed by salvage firm Titan Micoperi and worked mainly to defuel the vessel prior to its removal. They were detained by Italian police after CCTV images captured them boarding the vessel. The men were fired by Titan Microperi, who in a November 2013 statement said: "The company has taken immediate action to remove the workers from the project.” The prosecution had lodged a request for Mr Ruddy and Mr Freeburn to be jailed for a year each and fined €300, which was rejected by the judge. The "Micoperi 30" has interrupted the cleaning and restoration of the seabed of Giglio on Dec 1, 2017. Micoperi, a company from Ravenna, was tasked with restoring the sea bottom of Punta Gabbianara after the "Costa Concordia" shipwreck. The work should have been completed towards the end of the year. Micoperi, reports the newspaper again, began to dismantle the building site. Following the sinking of the ship and subsequent recovery, there were anchorages, sacks of cement used to create a false backdrop, steel cables and other stuff. The Micoperi company has ordered the transfer of the platform to the port of Santo Stefano, without stating the causes of a suspension that has no technical reasons but would appear to be due only to a specific company decision. There weree two possible scenarios that may have led to the decision. The first hypothesis was that a negotiation is under way between Micoperi and Costa Crociere in order to obtain a contractual rescheduling. In this case the choice of the Ravenna company would be aimed at strengthening its position. The second hypothesis was that Micoperi, having overcome by a serious financial crisis, has assessed that it was no longer able to complete the operations and has decided to terminate the contract. In this case Costa Crociere, with the penalties provided, should task a new company able to complete the last remaining cleaning month.